Example sound recordings of various noises or sounds made by air conditioners, heat pumps, furnaces, ductwork, or HVAC controls & filters. We discuss how we approach listening to and interpreting noises coming from an air conditioning or heat pump system & what different noises may mean. Sound & video recordings of air conditioning & heat pump compressor noises are provided & discussed here. CONTACT US by email to submit your own noise or noise+ video recording or if you cannot find the HVAC noise diagnosis information you need. Below are recordings and comments about abnormal HVAC system sounds. Start tracking down the cause (and cure) of noises from your air conditioning or heat pump system by listening carefully to determine the location of the sound. This brief video contributed by one of our readers demonstrates start-up troubles and characteristic buzzing at the outdoor fan-compressor unit. The unit is unable to start. Some guesses at what the noise heard in this cyclic compressor/condenser buzzing noise might mean are given below. CONTACT US by email to submit comments or suggestions about these noise recordings or to submit your own HVAC noise recording for publication, diagnosis, commentary. THIS 5-SECOND RECORDING is a large 8MB .mp4 file. Once loaded you may want to re-play it a few times to listen carefully to the cycling sounds of this compressor unit. - Ed. This brief video contributed by one of our readers demonstrates a repetitive cycling or humming/buzzing sound at a Carrier brand outdoor fan-compressor unit. The unit seems to be running but not properly, possibly this is a hard-starting compressor problem. More suggestions about what the noise heard in this cyclic compressor/condenser buzzing noise might mean are given below. My HVAC unit started making these cyclical noises [in the recording given just above]. It seems as if something is out of balance. This brief video contributed by one of our readers demonstrates a horrible rattling sound at an air conditioning system compressor/condenser unit start-up. MISSING SOUND - I'm working on it - Ed. 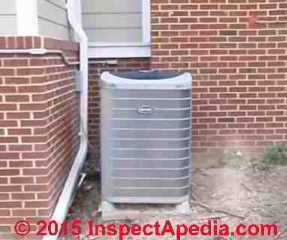 This recording of a clanking rattling sound at the air conditioner compressor/condenser unit was blamed on relay chattering though it sounds a lot like a fan noise problem. Also see FAN NOISES, HVAC as ticking and chattering may be traced to a fan problem. SCREAMING HVAC EQUIPMENT or whistling or shrieking A/C compressor/condenser unit sounds - warning about high pitched sound from the compressor/condenser unit ! Watch out: turn off a screaming air conditioner or heat pump. The cause could also be dangerously high refrigerant pressures. Some techs think screaming sounds may be a refrigerant leak but in my experience if there's a refrigerant leak lound enough for you to hear it it will be a hissing sound, and also it won't last long since your system is going to lose all of its refrigerant (and stop working) in minutes. Also see Whistling Sound Recordings just Below. This brief video contributed by one of our readers demonstrates a very high pitched sound at an air conditioning system compressor/condenser unit. Discussion of this noise is just below. The sound goes for about 7 or 8 minutes before the unit starts. I do not see anything moving when it occurs. When the blades start spinning, the sound stops. It always occurs at the start of the unit running....all day and all night. We have lived here almost 3 years and I would say I have noticed for at least the last year. The unit came with the house so it is 10 years old. The unit has no company logo on it but I searched the address and model number...I think it was made by Tempstar, a part of International Comfort Products. The model number is NAC242AKA5. Continue reading at NOISES, HVAC SOUND DESCRIPTIONS or select a topic from closely-related articles below, or see our complete INDEX to RELATED ARTICLES. or select a topic from closely-related articles below, or see our complete INDEX to RELATED ARTICLES below. Or see NOISES, HVAC SOUND RECORDING FAQs - questions & answers about recordings of air conditioner or heat pump or heater or furnace noises that were posted originally at the end of this page. NOISES, HVAC SOUND RECORDINGS at InspectApedia.com - online encyclopedia of building & environmental inspection, testing, diagnosis, repair, & problem prevention advice.